Know of an inspiring active U.S. serviceperson or veteran who’s making a difference where they live or serve? 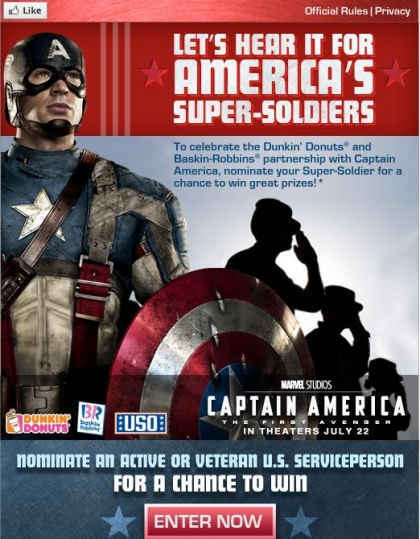 Nominate them by Friday, July 15, 2011, for the Dunkin’ Donuts and Baskin-Robbins America’s Super-Soldiers essay contest. 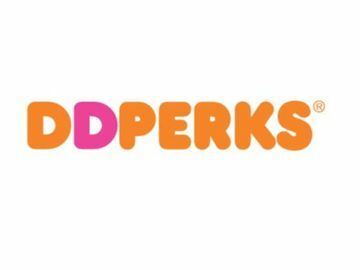 Developed by Dunkin’ Donuts and Baskin-Robbins, with support from the USO (United Service Organizations), you can nominate an active U.S. serviceperson or veteran on the Facebook pages for either brand. Submitting your nominee is easy – simply answer short questions about how your Super-Soldier is making a difference in their hometown and/or the communities in which they serve. Entries can only be submitted through the Salute Super-Soldiers Facebook application. The grand prize winning Super-Soldier, as selected by Dunkin’ Donuts, Baskin-Robbins and a representative from the USO, will win a cash prize of $5,000, a new high-definition television, a new Blu-Ray DVD player and a selection of DVD movies in which Dunkin’ Donuts and Baskin-Robbins products are featured. As a thank you, the nominator of the grand prize winner will also win a $1,000 cash prize and a $100 Dunkin’ Donuts Card. For official rules, please click here. The America’s Super-Soldiers essay contest is inspired by Marvel® Studios’ Captain America: The First Avenger. Arriving in movie theaters on July 22, action hero Captain America is created as part of the secret “Super-Soldiers” project. Through the America’s Super-Soldiers essay content, Dunkin’ Donuts and Baskin-Robbins are excited for the opportunity to honor America’s real unsung heroes whose service has had a significant impact in local communities throughout our country. 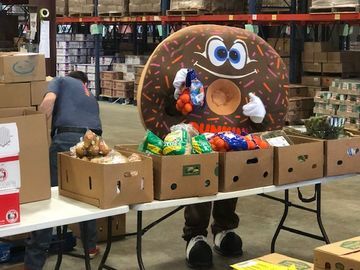 Dunkin’ Donuts has a long history of honoring America’s service men and women, and has donated more than 175,000 pounds of coffee to troops deployed overseas since May 2003. 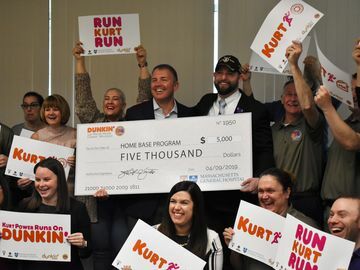 The company holds a monthly drawing to randomly select at least 50 United States military members to receive one case of Dunkin’ Donuts coffee. During the holiday season, Dunkin’ Brands’ corporate employees also send additional pounds of coffee to the troops. To nominate your Super-Soldier for the America's Super-Soldiers essay contest, please click here.